Whether it is an oven, mixer, sheeter, or another piece of equipment it is important that the equipment is installed properly. Most baking service equipment is heavy, large, and intricate. Our professional factory trained technicians will make sure that your equipment is installed properly according to the manufacturer specifications, to ensure safe and proper operation. We offer complete installation of ovens and dough processing equipment for most of the major manufacturers of bakery equipment. We specialize in products from Baxter, Douglas, Gemini, Oliver, Reed, and Rondo, but will install any manufacturer&apos;s equipment. We offer complete installation for most manufacturers. 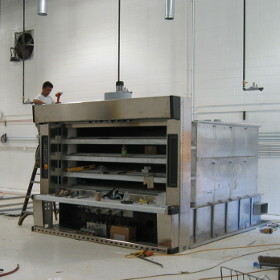 We also provide bakery equipment relocation and removal services for your convenience. Final hook-ups to existing electric, water, drain, gas and stream, etc. Lachnit provides the best in sheet metal fabrication and precision machining services, meeting the strict precision requirements of our customers. 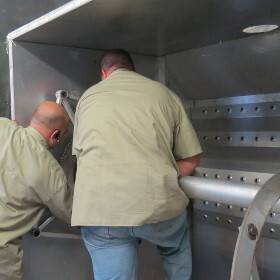 We offer full fabrication capabilities in aluminum, steel, and stainless steel, up to .250” thick. Machining services are done with the latest Windows based CNC machining, enabling fast production while maintaining high quality as well. Materials that are commonly used in machining include aluminum, steel, and thermoplastics. Copyright © Lachnit Inc. All rights reserved.